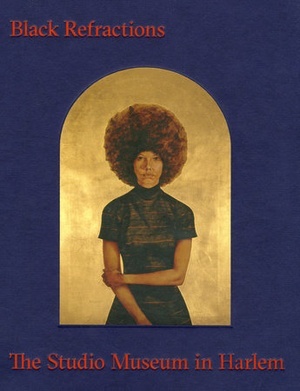 Book of the Day > Black Refractions: The Studio Museum in Harlem. Published by The American Federation of Arts & Rizzoli/Electa. "An authoritative guide to one of the world's most important collections of African-American art, with works by artists from Romare Bearden to Kehinde Wiley. The artists featured in Black Refractions, including Kerry James Marshall, Faith Ringgold, Nari Ward, Norman Lewis, Wangechi Mutu, and Lorna Simpson, are drawn from the renowned collection of the Studio Museum in Harlem. Through exhibitions, public programs, artist residencies, and bold acquisitions, this pioneering institution has served as a nexus for artists of African descent locally, nationally, and internationally since its founding in 1968. Rather than aim to construct a single history of "black art," Black Refractions emphasizes a plurality of narratives and approaches, traced through 125 works in all media from the 1930s to the present. An essay by Connie Choi and entries by Eliza A. Butler, Akili Tommasino, Taylor Aldridge, Larry Ossei Mensah, Daniela Fifi , and other luminaries contextualize the works and provide detailed commentary. A dialogue between Thelma Golden, Connie Choi, and Kellie Jones draws out themes and challenges in collecting and exhibiting modern and contemporary art by artists of African descent. More than a document of a particular institution's trailblazing path, or catalytic role in the development of American appreciation for art of the African diaspora, this volume is a compendium of a vital art tradition."